IKEA will manufacture a new furniture line called Uppleva that will integrate television, speakers, Internet connection, and multiple disc players into an all-in-one system. The overarching goal is not only simplicity but the desire to eliminate “cord clutter,” based on the responses to an IKEA-sponsored survey conducted this year that revealed what people dislike most about electronics. The television and other electronics will be made by Chinese manufacturer TCL and include a single remote control for all the devices. This is to address the survey result that found that 60 percent of respondents have between three and four remote control devices at home. The Uppleva (Swedish for “experience”) line will offer choices of HD LED TV sizes ranging from 24 to 46 inches, and in a variety of colors. It will also include Wi-Fi, USB ports for music players, and space for game consoles. The company is planning to launch in Sweden, France, Italy, Poland, Spain, Denmark, Norway, and Portugal in the fall, with a worldwide rollout in spring 2013. For baby boomers, this concept harkens back to the 50s and 60s, when audio-video equipment was always integrated into furniture. Who’s going to put this together? Are owners going to have to call Geek Squad to make sure it’s put together properly? Are the instructions going to be translated from Swedish or Chinese? What happens when you want to upgrade? One of the reasons integrated furniture gave way to component systems is that when you upgraded from 8-tracks to cassettes to CDs (or, more currently, from DVD to Blu-Ray), you could easily swap out one player for a new one. Furniture is supposed to last, but technology keeps changing. Is this IKEA and TCL’s way of selling the razor and the blade? In other words, when you do upgrade, will you only be able to swap out their systems? Otherwise, if you install a device from a different manufacturer, you immediately eliminate the simplicity of the integrated remote control -- and the cycle of clutter starts all over again. 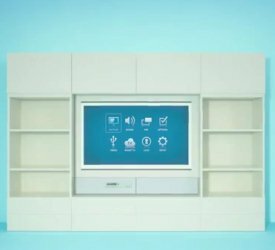 This story, "IKEA Integrates Home Theater System into Uppleva Furniture Line" was originally published by PCWorld.